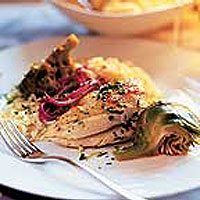 Chicken breasts, braised with artichokes, make a stylish dish. Use a knife and fork for the chicken, but encourage your guests to pick up the artichokes, pull away a leaf and eat the tender part at its base. Provide plenty of serviettes or finger bowls. Serve sprinkled with a gremolata, which is a combination of chopped garlic, parsley and lemon zest. Preheat the oven to 190°C, gas mark 5. Make a gremolata by paring the zest of the lemon and mixing with the parsley and garlic. Cover and reserve until required. Place the onion in a roasting tin, pour in the stock and add the chicken, skin side up. Cut the lemon in half. Slice one half and add to the tin, then squeeze the other half over the chicken and reserve. Prepare the artichokes (see below), then cut them into quarters and add to the roasting tin. Season, cover with foil and cook in the oven for 20 minutes. Remove the foil and cook for 30-35 minutes more, until thoroughly cooked and golden brown, there is no pink meat and the juices run clear when the meat is pierced with a fork. Scatter with the gremolata and serve with buttery rice. You could substitute the artichokes with prepared artichoke hearts in oil. They are available from the delicatessen chiller cabinet or in jars. Drain the oil and add to the chicken when the foil is removed during cooking. Trim the stalks and pull away a few of the tough outer leaves. Using a large, sharp knife, cut the tops off to expose the heart.